World Health day 2019 Quiz Competition for Undergraduates students. World Health Day (WHD) is the global awareness day on specific health problems affecting the community at a large. It is celebrated on 7th April every year since 1950 every year. And the theme for this 2019 is “Universal Health Coverage: Everyone, Everywhere”. But millions of people still have no access at all to health care. Millions more are forced to choose between health care and other daily expenses such as food, clothing and even a home. This is why WHO is focusing on universal health coverage for this year’s World Health Day, on 7 April. IAPSM being the group of professional working against public health problems is also celebrating World Health Day to generate awareness amongst the general people. As medical students are important soldiers against health problems, IAPSM has started nationwide IAPSM-WHD-Quiz competition for Medical Students since the year 2016. 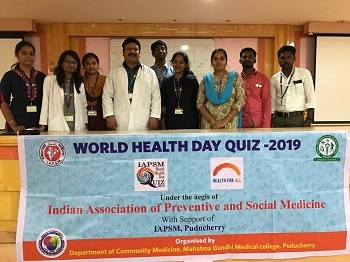 Aim of the IAPSM-WHD-Quiz is to sensitize Under Graduate Medical Students on Health Problem identified for world health day. The quiz is held on 8th April i.e on the same day across India. 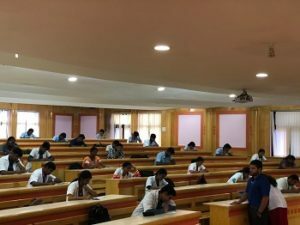 As per IAPSM guidelines, the initial elimination round conducted based on multiple choice question which held on 2nd of April 2019 in which 16 teams participated. Four teams were selected out of 16 teams from elimination round for the main quiz which was held on 8th April 2019 as 7th April is being Sunday. 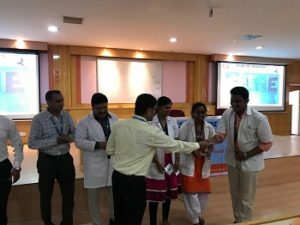 The quiz competition was organized by Dr.S.Arun, IAPSM Nodal person for World Health Day Quiz 2019. The unique thing about this event was that a Quiz Competition was organized at a national level on the same day everywhere with such a large number of participants and audience with uniformity and quality. Needless to say that this quiz not only generated awareness about this important topic among faculty and students but also increased the visibility of the subject of Community Medicine in general. It has been possible because of the guidance given by our HOD Dr. Seetharaman and Dr. Rajesh Kumar Konduru IAPSM Pondicherry state Secretary. And a special Thanks to our Dean and the management of MGMCRI for giving the financial and technical assistance, and Jaypee publications for sponsoring the Community medicine textbooks. Top 4 teams were selected out from 16 teams for the Final quiz competition as per IAPSM guidelines. The final quiz was conducted by the quiz master Dr. Sinthu Sarathamani and Scoring by Dr. Anugraha and Dr.Karthikayini. Totally 5 rounds of the quiz which includes Just a minute, MCQ round, Hint round, Visual round, and Rapid fire round were conducted as per IAPSM guidelines. First prize: Miss.S. Dhiviya, Miss.K.Yakshetha, Mr.K.Narendren, Final Year MBBS. Second Prize: Miss. Shivani, Miss. Sharikha Rajaamii, Miss. Shivali, Third-year MBBS. 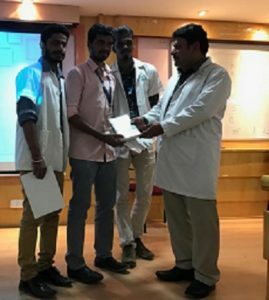 Third Prize: Mr.Shathik Basha, Mr.Cheran, Mr.Saneesh, Third-year MBBS.